The Louis Vuitton Trompe L'oeil Screen Damier Azur Speedy 30 is another bag made by this fashion house and based on the ‘’deceive the eye’’ art direction, known in France as Trompe L'oeil. Basically, it means that the artist will make the painting look like 3D. Without question, this is just the perfect choice for handbags. The main material here is the damier azur canvas which was decorated with the impressive art designs. Then we have a cotton lining and leather patches. All of this is beautifully paired and comes in a combination which looks stunning in the lack of a better word. Add the gold-colored hardware and you have a bag that will be noticed, regardless of the fact where you are at the moment. The lock you can see here is one of the rarest today. It is borrowed from the Louis Vuitton archives and it is the most appealing type we saw. And yes, it also makes the bag looks traditional, yet modern in a unique way. Obviously, some of you will love while others will hate this lock. Carrying the bag is possible with the Toron handles at the top or adjustable shoulder strap which can be removed as well. Now space. You get one massive compartment which is secured by the aforementioned lock. Space is sufficient for all accessories you may want to carry with you and it is suitable for women who want a small bag with a lot of interior space. A D-ring is present as well. 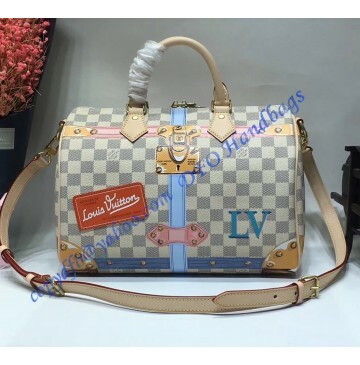 The Louis Vuitton Trompe L'oeil Screen Damier Azur Speedy 30 is just ideal for women who are on the move and who need a small, practical bag daily. It is beautifully made and it looks like no other, but it is still a small and practical creation with the accent on usability.